Chemical peels are a safe and quick way to help rejuvenate the skin. 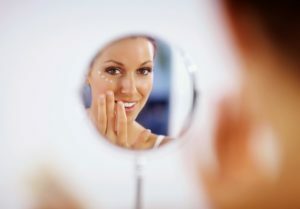 While there are a number of different types, the general technique is to use a chemical solution to remove older dead skin on the surface, which is peeled away to reveal the more youthful newer skin cells underneath. This process is not instant, and it can take days or even weeks for the old skin to completely fall off. While this is happening, the skin can be extra sensitive. Here are some of the post-peel skincare tips that we recommend to our patients. We understand that nobody likes walking around with flaky skin on their face, but it’s important to be patient and wait for the skin to rejuvenate at its own pace. Avoid picking, scratching, or pulling on the skin, as prematurely removing skin can lead to scarring. This also includes using a washcloth or facial scrub, which can cause small scabs to form on the skin as new cells are removed along with the old. One of the most important things a person can do after getting a chemical peel is to avoid the sun. The skin is extra vulnerable after a peel and even a short amount of time exposed to direct sunlight can lead to a nasty burn. When you do go outside, use extra-strength sun protection products with SPF 30 or higher to protect the skin. Sticking to your regular skincare routine is not a good idea if that routine involves products that use acids or alcohol. Opt for gentle, water-based products that are specially formulated for repairing damaged skin. A good moisturizer can help soothe irritated skin in the short term and even speed up the healing process. The board-certified dermatologists and aestheticians at The Dermatology Clinic have decades of experience providing skin treatment to our patients. We use a range of procedures, including cutting-edge techniques like MicroLaserPeel, to help give our clients the smooth, beautiful skin they’re looking for. To learn more about chemical peels or any skincare procedure, call (225) 769-7546 to schedule an appointment today.